Duck is an Outer Banks beach town located on the northern Outer Banks in Dare County, North Carolina. Duck offers family-friendly, private beaches accessible by guests and residents of Duck, NC. Visitors to Duck enjoy the bike/walking path throughout the town and the quaint shops and local restaurants in the heart of the town. Duck vacation rentals are situated in Oceanside and Soundside communitites with community beach access. Each community offers different amenities; in this blog we have picked out some of our favorite. On any of our search pages you can select filters to help you narrow down your search. 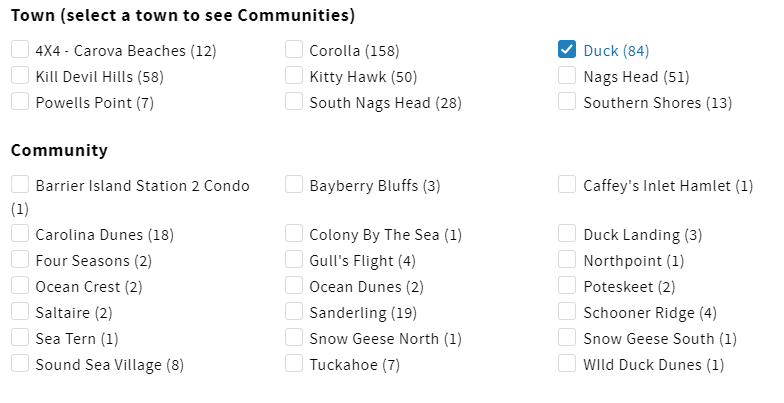 If you select a town it will show you all of the communities in that town below, and how many homes we have in that community. This is great if you are trying to find multiple homes near one another. On the right hand side of the search, you can see the map view. If you zoom in it is very easy to see which homes are close to one another. Four Seasons is a well-planned community located in downtown Duck. Amenities include beach access with parking, soundside pier and park, lighted sidewalks throughout and an in season trolley service. The clubhouse has an indoor pool, fitness center, gameroom and lighted tennis courts. Other features include an outdoor pool, playground, volleyball courts and basketball court. As the name implies, Four Seasons is a great place to vacation no matter what the season. Located in the village of Duck, Schooner Ridge, and its high elevation, gives guests captivating views. The clubhouse has a recreational room offering video games, air hockey, and pool table. Maintain any workout routine with the exercise facility, including aerobic machines, free weights and much more. There is an outdoor pool that is oceanfront and a heated indoor pool. Many shops, restaurants, and entertainment are conveniently located outside the community. Duck Landing is located between the Albemarle Sound and the Atlantic Ocean. Take a dip in the indoor heated pool (also available, heated kid’s pool) anytime of the year! Duck Landing offers weight/exercise rooms, tennis courts and a game room, all located at the Oceanside clubhouse. Take a short walk to catch a glimpse of the sound and the nearby boutiques and shops. After shopping, try one of the restaurants to enjoy a unique dining experience. Duck Landing truly offers a one-of-a-kind experience for the family. Have you planned your 2019 Outer Banks Vacation yet? Start below!